Here’s the skinny on a Bahamas yacht charter – no punches pulled. a) the Bahamas is a great – maybe one of the greatest – charter and cruising destinations in the world. b) It is not wise to do a one way charter from mainland Florida to the Bahamas and use a charter yacht as transportation..!! c) Yes, it can be done in winter, with the caveats listed below regarding pick-up location and cruising itineraries. Wonderful beaches, very friendly locals, incredible snorkeling and diving – and yes, you can actually get away from it all when you leave the major population centers and get to the Exumas, the Abacos, the Out Islands. The waters are shallow (the name Bahamas = Baja Mar in Spanish; a name given by Christoper Columbus) and a lot of local knowledge is required if you are going it alone. Check our Bahamas destinations page on this website. The best time of year for a Bahamas yacht charter depends primarily on the cruising area you choose. The Bahamas is a deceptively large archipelago comprising over 700 islands and Cays that covers over 100,000 square miles and is over 500 miles long from North to South. Summer time is the best and the water and ambient temperatures are warm all over the island group. 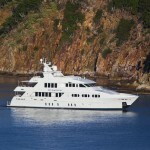 For winter charters you should choose locations and itineraries that take you South from Nassau. The Northern islands like Grand Bahama Island and the Abacos, are similar in their weather patterns to South Florida and cold weather fronts are always a risk in winter. If you pick up your yacht in Nassau or other more Southern location, the captain will certainly discuss an itinerary that will take you Southwards. The best pick-up location is Nassau where there is a fine international airport and great hotels and interesting and entertaining things to do and see before or after your charter. There are other smaller airports scattered over the islands so you are not limited to Nassau. For example you can pick-up the yacht in Harbour Island, Staniel Cay, Georgetown, San Salvador, Mayaguana, and Matthew Town on Great Inagua Island where there is an incredible National Park. For a summer Bahamas Yacht Charter, you can fly to Freeport on Grand Bahama Island, or Marsh Harbour in the Abacos to pick up your ship. These are some of our favorite destinations to see during your trip. The waters in the Sea of Abaco are shallow however and there are draft restrictions. For a complete guide to the region see our the Bahamas blog on this website. • Harbour Island offers upscale restaurants and shopping in Dunmore Town, where golf carts are the preferred mode of local transportation. Fewer than 2,000 people call Harbour Island home, making it an “away-from-it-all” destination that still offers the fineries of civilization. • Eleuthera is one of the easternmost, or “out islands,” of the Bahamas. It’s also one of the skinniest, with a spot called Glass Window Bridge where the island is just two vehicle lanes wide. It’s quite an experience to stand on the bridge and see the deep, blue Atlantic Ocean on one side with the calm, turquoise Caribbean Sea on the other. Park, which was established in 1958 and comprises more than 112,000 acres. All fishing is prohibited, which means the underwater views are pristine. yacht’s crew can take you by tender to the grotto so that you can snorkel like super-spy 007.
her front feet on your tender’s side. 90-foot cutter Austin Smith is also nearby, typically in about 60 feet of water. while you stand barefoot in the sand enjoying the view of the crystal clear waters beyond. spend the afternoon at the water slides, casinos, and pool within the Atlantis complex as part of a land extension after your charter. A Bahamas yacht charter is one of the most marvelous experiences in the world. It’s shallow, crystal-clear waters offer a superlative charter experience any time of year. (with the above mentioned reservations regarding weather and location) Do NOT start your charter in Florida and attempt to cross the Gulf Stream on the first leg. Always consult with your captain regarding the best itinerary under the prevailing weather conditions. Call us or fill in our handy short contact form (even better the long form so we have as much information as possible) or email us at charters(@)americanyacht.net with all the requirements, and we’ll put you on the perfect yacht for your vacation. 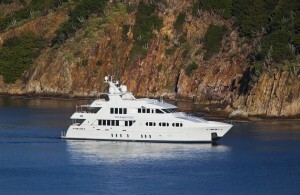 This is truly a great article about chartering in the Bahamas – highly recommended.